"A Neptune patrol bomber attached to a Jacksonville Naval Air Station Squadron was reported missing in the storm-tossed North Atlantic Sunday. Winds as high as 75 miles per hour and visibility confined to 200 feet hampered the search but seven planes were sweeping the area with radar in the hope the plane may have come down on the ice pack." Patricia Masciantoni's mother told her Daddy would probably not be coming home. But the words were as meaningless to the 6-year-old as a book without pictures. certain he would never come home, she would be rushed off to the base with her brothers and sister to welcome home their hero, Commander Norbert Kozak, Executive Officer of VP-5 Madfoxes. This time would be no different; it would just take him a little longer to get home. But he would lead his crew home and she would be waiting. "I just thought he was walking home," said Masciantoni, who now lives in Orange County. "You know, from a kid's perspective when your bike tire went flat, what did you do? You walked home. His plane went down, so I thought he was walking home." Mike Kozak, Masciantoni's older brother in Orlando, remembers the words of the man who brought the news of the crash: "Bert's plane was lost, but we're looking, and we're going to find it." The 7-year-old would later join family in a search to find the missing crew members and bring them home -- only their quest would begin almost 40 years later. Search and rescue operations continued for eight days after the initial report, thwarted by heavy snow and high winds in a land of bleak, white barrenness. Efforts had to be terminated because of unmanageable conditions and all 12 men aboard the aircraft were declared dead, including their pilot, Kozak. So the crew never did walk home and still his children waited patiently until nearly five years passed without a father. "The telegram came at 5 a.m. yesterday. A British research expedition, moving across the bleak Kronborg Glacier in Greenland a few days ago, discovered the bodies of 12 U.S. Navy men where their plane had crashed into the ice on January 12, 1962." She turned 11 the year they found her father and this time Masciantoni went to Arlington National Cemetery to welcome him home. "There was perfect silence that day and you could hear the flag snap as they folded it because it was so tight," Masciantoni said of her father's funeral. The service made Kozak's death real for his children. They could finally leave him to rest in a sea of marble headstones next to the men who fought beside him in World War II, the Korean War and the Berlin Airlift. His remains had been found, but because of the grueling weather conditions, some were never discovered and were left in a snowdrift-grave on the top of the Kronborg Glacier -- something the Kozaks did not learn until two months ago. In August, Masciantoni received a call at her Apopka home from Robert Pettway, a former VP-5 crew member who has spent the better half of a year researching the fate of his fellow servicemen. The Tennessee man had learned there were reports of human remains lying exposed on the glacier. They joined forces -- a daughter, two sons and a buddy -- to try to bring home Kozak's crew that was left behind. "You never leave your men behind," said Mike Kozak, the oldest son of Commander Kozak. Because he was commanding officer of the flight, Kozak was responsible for his crew. In his absence, Kozak's children have decided to step in for their father. "Our dad can no longer be the advocate for his crew," Kozak said. "His reputation was that he took care of his crew and this would close that chapter." " ... looking for any additional information about the plane and crew (LA-9, 131521) that was lost flying out of NAS Keflavik, Iceland, on January 12, 1962 ... I knew those guys, one of which was a close buddy." squadron and retired Secret Service agent Robert Pettway was discharged from the Navy in 1964 -- two years after his fellow servicemen went down and two years before they were found -- to begin a career in the Secret Service, but he never forgot about the fate of his friends. His interest was piqued in March when he stumbled across a Web site dedicated to the men of VP-5. After Pettway learned the plane had been found and the crew recovered, he began searching for other answers about the crash. "I have wondered about the fate of Crew 9 since the tragedy happened in '62," he said. "What was the cause of the crash? Who found the aircraft? Was the crash due to inclement weather, or did they experience a systems failure and attempt to ditch on the icecap?" He began a letter-writing campaign and requested official Navy documents into the investigation and the 1966 search and rescue mission. He found the Kozaks -- Patricia and her brothers, Mike and Peter. His searching eventually led to more answers, more details and one name: Kent Brooks. "Human remains. I thought I saw human remains as we hovered in the helicopter, but discounted it as I had heard all bodies were recovered. Later, the pilots told me they had found such and I was pretty surprised, not to say upset." -- Kent Brooks, who revisited the crash site in 1995 after heading the expedition team that discovered it in 1966. The site is covered by snow most of the year, but in the summer the snow melts and the crash lies exposed on ice. Kent Brooks has been there before. It was 1966 and he was leading the team of geologists across the glacier when they stumbled on the scrap metal that used to be a Navy bomber and its fallen crew. He alerted the Navy then and all was taken care of. 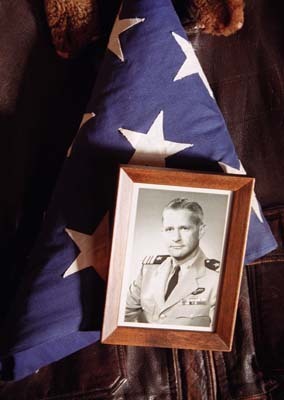 Nearly three decades later, he returned on another expedition and could see the aircraft scattered and weather-worn with partial remains of its crew members. It was Brooks who told Pettway of the human remains. It was Pettway who contacted the Kozaks. It was the Kozaks who began piecing together the framework of a search to bring their father's crew members home. The pile of letters to potentially sympathetic congressmen, Navy officials and even the president have begun to fill up file folders in Masciantoni's home. The response has been slow, but several congressmen have agreed to forward their requests to an appropriate source. The group is determined yet knows the challenge that lies before them. This crash site is one of several that contains the remains and personal items of servicemen. They are not looking for a recovery mission to Greenland before next summer, but have dedicated themselves to the cause if it takes longer. "It boils down to a matter of politics and money," Pettway encouraged the team. "The squeaky-wheel principle is most applicable; make enough noise to accomplish our goal."